Walvis Bay has an approximate population of 55 000 people from various ethnic groups and a large variety of religions. Walvis Bay means, "Whale Bay". The harbour with its deep waters is full of Plankton which is the massive attraction for whales as it is part of a whales staple diet. Walvis Bay is undoubtably becoming one of the most popular coastal holiday destinations. It has a well established fishing harbour which allows for many job opportunities for the locals. Walvis Bay has one of the largest salt fields and processes up to 24 million tons of sea water each year to produce tons of salt to be shipped to the markets, this too offers job opportunities and tourists. Walvis Bay has a few fish markets where you can find a variety of fresh seafood on crushed ice. Another one of the main attractions is the natural lagoon where over 120 000 birds, including Flamingoes and Pelicans can be found. Being on the coast, Walvis Bay is a huge angling attraction. Scuba diving is very popular as well as stunning views and sandboarding from the top of the well known sandune called, Dune 7. For the avid golfer, there is a Golf Course situated in the beautiful desert. There are numerous hotels and restaurants to visit and the Walvis Bay Museum is well worth seeing. The average rainfall in Walvis Bay is less than 20mm per year and the temperature remains cool to moderate throughout Summer. 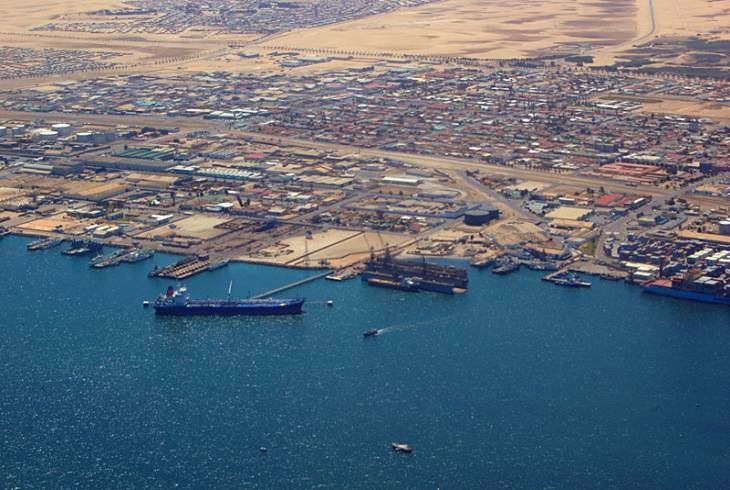 Walvis Bay overview. Walvis Bay Accommodation and Information.